Gard Little is Research Director for IDC's Global Services Markets and Trends research team, with programs that focus on Worldwide Services, IT consulting and systems integration, and digital transformation professional services. Mr. Little's core research on digital transformation includes analyzing customer demand and vendor offerings for building new business processes, organizations and systems using cloud, business analytics, enterprise mobility, and social business technologies. Mr. Little's research also includes an emphasis on emerging service opportunities related to the Internet of Things and cognitive systems. Customers' consistently ranking discrete cloud professional services helps create a more effective business above lowering costs. Customer acceptance of a hybrid cloud approach for IT operations is increasing. Establishing an appropriate and high-quality team has become a crucial factor for a successful cloud professional services project. 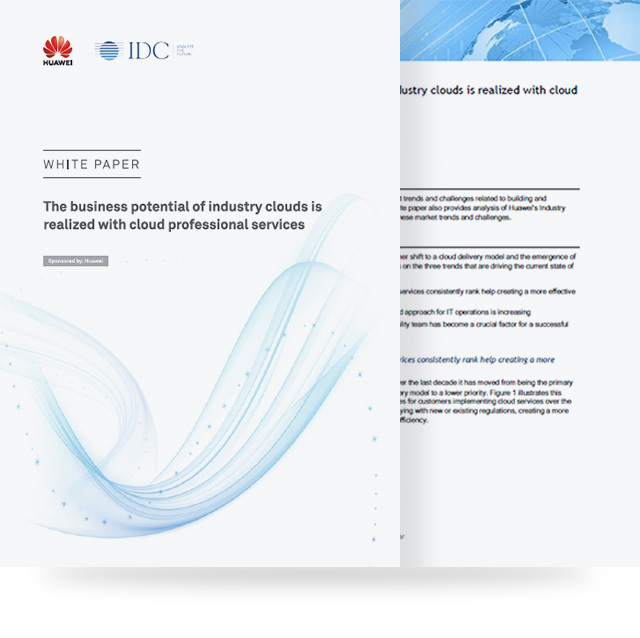 This IDC white paper reviews important market trends and challenges related to building and implementing industry cloud services. This white paper also provides analysis of Huawei's Industry Cloud Enablement offerings in the context of these market trends and challenges. "Cloud service providers, like Huawei, recognize that the cloud delivery model is about more than cost reduction, and have created a suite of end-to-end services that reinforce one another and deliver greater client value."